Genesis PGM/Polymetallic Project – New Age Metals Inc.
On April 4th, 2018, NAM signed an agreement with one of Alaska’s top geological consulting companies. The companies stated objective is to acquire additional PGM and Rare Metal projects in Alaska. Our first acquisition, The Genesis PGM Project is a road accessible, under explored, highly prospective, multi-prospect drill ready Palladium (Pd)- Platinum (Pt)- Nickel (Ni)- Copper (Cu) property. A comprehensive report on previous exploration and future phases of work was completed in August 2018 on Genesis. The Company is seeking to explore JV options with qualified companies through using the Prospect Generator Model. This report was completed by Avalon Development of Fairbanks, Alaska. If you would like a copy of the report please visit sedar.com or send a message to info@newagemetals.com. The Genesis project is a Ni-Cu-PGM property located in the northeastern Chugach Mountains, 75 road miles north of the city of Valdez, Alaska. The project is within 3 km of the all-season paved Richardson Highway and a high capacity electric power line. The Genesis property is located in south central Alaska, approximately 82 km northeast of the port city of Valdez, Alaska, and approximately 8 km east of the Richardson Highway (Figure 4.1). The project is located between the Copper River and the Tonsina River, at approximately 61.575 deg. North Latitude, 145.035 West Longitude. 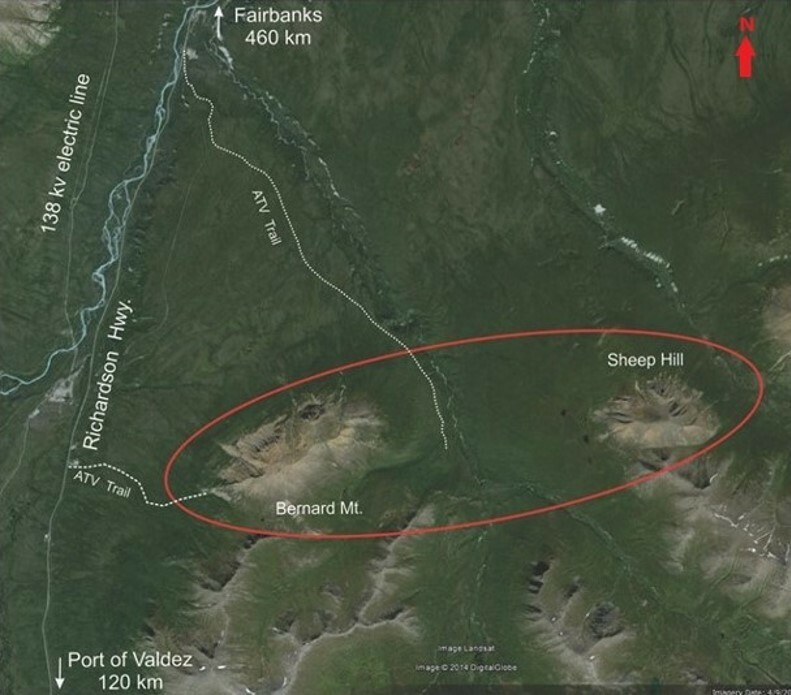 The project is covered by 4,144 hectares of State of Alaska mining claims owned 100% by New Age Metals. The Genesis project has been divided into the Sheep Hill prospect and the Bernard Mountain prospect based on their differing geology and location both on the property and within the magmatic stratigraphy of the TUC. On April 18th, 2018, NAM announced the right to purchase 100% of the Genesis PGM Project, NAM’s first Alaskan PGM acquisition related to the April 4th agreement with Avalon Development Corp. The Genesis project lies within the Tonsina Ultramafic Complex (TUC) of the Peninsular Terrane, which consists of Jurassic ultramafic and mafic rocks ranging from dunite to gabbro. The TUC forms a small portion of a much larger geological feature known as the Border Ranges Ultramafic and Mafic Complex (BRUMC, Burns, 1985). The BRUMC is a discontinuous trend of tectonized and dismembered, ultramafic, cumulate, and gabbroic rocks associated with the Border Ranges fault zone in southern Alaska. The BRUMC forms a narrow zone (2 – 10 km wide) which can be traced for more than 1,000 kilometers, from Kodiak Island to the Alaska-Canada border. Field and petrological studies indicate the BRUMC represents the basal portion of an intra-oceanic island arc (Burns, 1985; DeBari and Coleman, 1989). In the Genesis project area, the Border Ranges Fault zone (BRF) contains both high and low angle faults, although steep, north-dipping faults predominate. The BRF was the focus of major northward underthrusting of the Chugach terrane beneath the composite Wrangellia-Peninsular terrane during the late Cretaceous (Burns, 1985; DeBari and Coleman, 1989). Past exploration has revealed the presence of chromite-associated platinum and palladium mineralization and stratabound Ni-Cu-PGM mineralization within steeply dipping magmatic layers of the Sheep Hill portion of the Tonsina Ultramafic Complex. Pyrrhotite, pentlandite, and chalcopyrite occur in disseminations and net textured segregations associated with disseminated to banded chromite within a 150 meter thick steeply north dipping layer of dunite and lherzolite just north of the Border Ranges Fault zone. The mineralized horizon has been identified in outcrop sampling for 850 m along strike and a 40 m true thickness. The identification of two different styles of PGM mineralization at Sheep Hill suggests that multiple mineralizing events have occurred. The parental magma for the Tonsina Ultramafic Complex contained highly anomalous concentrations of PGM and Ni. More exploration is required to define if a reef event has formed the stratabound magmatic sulfide mineralization and if the geochemical patterns caused by reef formation hosts economically significant Ni-Cu-PGM mineralization in the Tonsina Ultramafic Complex. Year 1: Initial efforts at Genesis should focus on detailed geologic mapping (1:1,000 or better), grid-based lithogeochemical sampling, 2D and 3D reinterpretation of previously completed airborne and ground geophysical surveys, and acquisition, interpretation and groundtruthing of hyperspectral imagery over the Tonsina Ultramafic complex and vicinity. This effort will require some pre-season desk-top work (geophysical reinterpretation and hyperspectral analysis) followed by field work centered on 6 to 8 person tent camps that are emplaced by helicopter but which do not have daily helicopter support. The focus of field efforts will be detailed geologic mapping and lithogeochemical sampling designed to locate and define both bedded and chromite-related Cu-Ni-PGM mineralization to a degree sufficient to target drilling in year 2. All analytical work will include Pt+Pd+Au by fire assay and multi-element IPC-AES analysis with 4-acid digestion. Total estimated cost of this program is approximately $500,000. Year 2: exploration recommended for year 2 will be focused on initial scout drilling of one or more targets as refined by year one efforts. Approximately 2,500m of drilling is included in this program. Hole coordinates, inclinations and azimuths will be refined using results from year 1 field efforts. Drilling will be helicopter supported using an LF70 or CS1000 or equivalent drilling rig supplied with water derived from local streams or ponds. Drill support will be from a contract tent camp capable of supporting 10-12 persons. All drill core will be logged, photographed, and sawed with one-half of the core remaining in archive, the other half being shipped for geochemical analysis. All analytical work will include Pt+Pd+Au by fire assay and multi-element IPC-AES analysis with 4-acid digestion. Total estimated cost of this program is approximately $1,000,000. Year 3: exploration recommended for year 3 will be focused on definition drilling of the most promising target drilled in year 2. The goal of year 3 efforts will be to advance at least one target to the inferred resource stage. Approximately 5,000m of drilling is included in this program. Hole coordinates, inclinations and azimuths will be refined using results from year 2 drilling efforts. Drilling will be helicopter supported using an LF70 or CS1000 or equivalent drilling rig supplied with water derived from local streams or ponds. Drill support will be from a contract tent camp capable of supporting 10-12 persons. All drill core will be logged, photographed, and sawed with one-half of the core remaining in archive, the other half being shipped for geochemical analysis. All analytical work will include Pt+Pd+Au by fire assay and multi-element IPC-AES analysis with 4-acid digestion. Total estimated cost of this program is approximately $1,500,000. Known PGM mineralization covers distance of 9 km across the prospect.